Introducing the ORTHObones Standard Femur, Right by 3B Scientific. 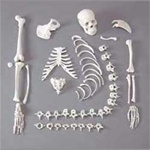 It is a high-quality training bone brought to you by the pioneering German company engaged in the production and distribution of medical quality anatomical models, teaching aids and charts that are widely used in in the field of anatomy, physiology, and in medical offices across the globe. This Femur bone model is a precise anatomical replica that is scientifically accurate. The femur bone is the longest and strongest bone found within the thighs. It carries the weight of the upper human body and permits movement of the legs. That is why this artificial bone provides a great degree of realism and is a great addition to any bone collection. It is an ideal learning tool which allows for extensive examination of the femur bone and furthermore it greatly provides auxiliary learning to students of anatomy and physiology. As an addition to the more familiar ORTHObones PREMIUM brand, 3b Scientific now offers a modest substitute for medical workshops, the ORTHObones Standard line of anatomical models. This new line of training bones adheres to the same strict medical standards while giving you exceptional value for your money. The new ORTHObones standard is consist of a hard and soft layer. In which, its two-part design allows for a realistic image and haptics. The exterior portion of the ORTHObones STANDARD is not as hard as that of ORTHObones PREMIUM which makes it ideal for performing mock surgical procedures such as spinal nailing or hip replacement procedures. 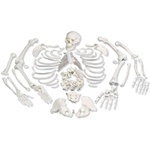 ANATOMICALLY ACCURATE- This Femur bone model is a precise anatomical replica that is scientifically accurate and provides a great degree of realism and is a great addition to any bone collection. IDEAL LEARNING TOOL- It is an ideal learning tool which allows for extensive examination of the femur bone and furthermore it greatly provides auxiliary learning to students of anatomy and physiology. PERFECT FOR MOCK SURGICAL PROCEDURES- The exterior portion of the ORTHObones STANDARD is not as hard as that of ORTHObones PREMIUM which makes it ideal for performing mock surgical procedures such as spinal nailing or hip replacement procedures. 3B SCIENTIFIC® PRODUCT MADE IN GERMANY- This product is manufactured by 3B Scientific in Germany. A globally recognized brand standing for quality, durability, and detail. 3B Scientific is one of the premier anatomical model manufacturers we carry at ShopAnatomical. REALISTIC- The new ORTHObones standard is consist of a hard and soft layer. In which, its two-part design allows for a realistic image and haptics.